It took me a little while to find a community of bloggers I could connect with, but once I did….it was like a whole new world opened up! If you are a blogger – new or old – you should know about these amazing groups. There are these Facebook groups for bloggers to connect, learn, encourage, inspire…it’s just amazing and exactly what I was looking for. Not only do the women in these groups help me learn and grow as a business owner, but they really are a source of support and community that is sometimes lacking when you are home all day. There are MANY groups and I encourage you to try a few and see which ones fit your needs. Not every group is for every personality and that is OK. You will know when you find the right group for you and where you are in your business. I may be partial, but this is my absolute favorite blogging group. I started this group because I saw something missing in the world of blogging groups. I wanted a group of women only bloggers, who focused more on helping each other and making genuine connections than on competition. I have made some great friends in this group and look at it as way more than just a blogging group. The support is amazing, the women are kind, helpful, and truly there to help one another. It is a joy to be part of it. JOIN BLOGGING WITH HEART HERE. This group was originally started by my sweet friend Christina at The Whole Cook and she did a phenomenal job at creating a community of women who are friendly, helpful, and fun to be around. She recently stepped down and handed the group over to Megan, who is continuing to provide a great group for ladies looking for support and growth along their blogging journey. JOIN GROWING SOCIAL MEDIA FOR BLOGGERS HERE. This group was started by Inez Bayardo of For The Love of Mom. The tagline is “a support and promo community for mama influencers” and it lives up to its’ name. The group also have smaller, niched down groups that are offshoots of this larger one, so you are sure to find one that suits your needs. Inez is super helpful too! JOIN INFLUENTIAL MAMAS HERE. This group was started by my friend Jen Snyder of Women Winning Online. She has created a great community of women here. The tagline for this group sums it up perfectly! This group is more about community and education than social sharing, which is definitely needed as a blogger! JOIN WOMEN WINNING ONLINE HERE. Carmen Brown and Natalie Venegas started this group together and it is amazing. If you are a Christian blogger, you want to be part of this group. The support and connection among members is truly hard to find anywhere else. Not only do you get support and education for your blog, you get prayed for when you need it and women to come alongside you when you are struggling. JOIN BY HIS GRACE BLOGGERS HERE. I am confident that you will find your perfect community in one or more of these groups. I personally have been blessed by each one, in different ways. Like I said before…try them out and see which ones fits you and leave if they don’t. Having a blogging community makes ALL the difference in this crazy adventure! Do you have any other blogging communities you love and recommend? There were so many groups I have never heard of prior to this post! Thank you so much for sharing this! You are welcome Kiara! See you in them! I haven’t heard of any of these groups, thanks so much for sharing! I love networking and finding other bloggers to support! I am so glad you found them then 🙂 It is one of the best things about blogging- the networking. This is such a great post which compiles all the groups well. I am part of some..will join the rest. Thanks for sharing this post! Thanks for the recommendations! I had not check out a few of these. This is a great list, some I haven’t heard of! I love love love the Bloggers Gonna Blog community as well! I have not heard of some of these groups. I must go join to get help. I love Bloggers Get Social. Such a dynamic and diverse group of bloggers. I’m going to check out some of the others that you mention! I love that group too! There’s so may great ones! I love that group too! I love being a part of groups like these, but I really wish more real engagement would come from then. I do not get many genuine followers, but even one matters! Facebook groups are SO beneficial, and I’ve gotten so much out of them! I did find that I had to be careful, though — I once joined way too many and became overwhelmed! That is a great point. Too much of anything can be problematic, even good things. I get to the point of information overload and know I need to take a step back. The good thing about these groups is that you can turn off your notifications. I’m a member of a couple of these but looks like I have some new ones to check out. Thanks for sharing! You are very welcome Rachel! I am not in a bunch of these. I will have to check them out. I have quite a few I love but they have waiting lists right now! Oh wow, I didn’t even know some had waiting lists! thank you so much for this list! I am a new blogger and I am ALWAYS looking for tips on what I am supposed to be doing, lol! I hope it helps you Jessica! Blogging can be so much fun! Thanks for introducing me to a few new groups! I find the ones that I belong to to be very helpful. You are welcome Stacey! Hope to see you in some of them! This is a great resource! I love finding new ways to network and support other bloggers! I belong to The SITS Girls, but I haven’t checked in for awhile. One of my favorite Facebook groups is Grow Your Social. What a great list! I haven’t heard of a couple of these, and I am definitely going to check them out. 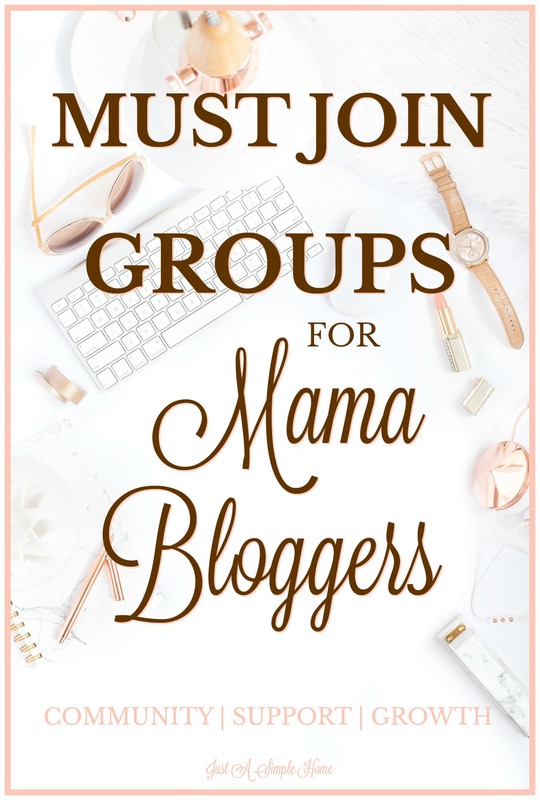 I am new to “blogger groups” even though I have been blogging for over 5 years…great info! Ooooo finally someone suggested a few groups I’m not a member of! I’m a member of sit girls but the rest are new to me! I have learned so much in all the groups I have been in. I love SIT Girls! Being in FB groups helps you learn from other bloggers! Thanks for posting this. It’s always good to know that there are other groups out there and what the pros are for joining them. Thank you so much for sharing this Terryn, this is such a helpful tool for everyone who is trying to become part of the blogger community! You are so welcome Sabrina! I hope you find one that you can attend! You are so welcome Sheena! Hope you find some amazing groups to join!